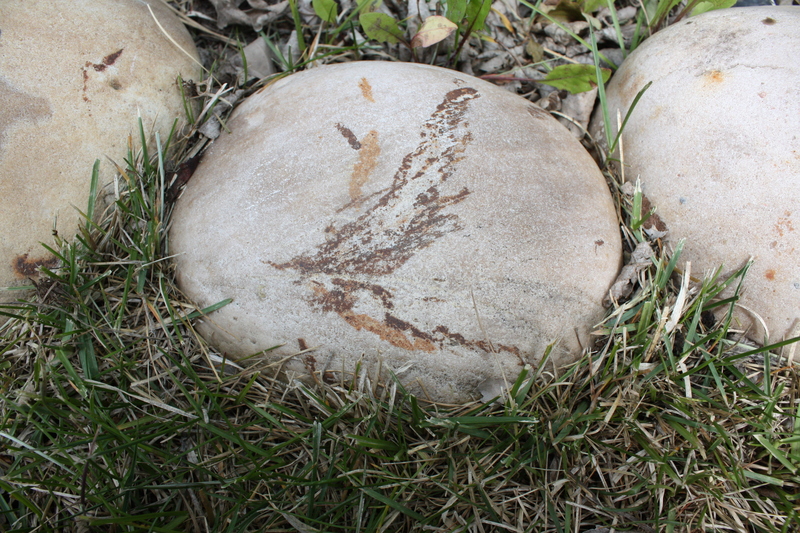 In the clay and rock fill that keeps getting piled up to make a park behind our house, we sometimes find these eggshell-coloured rocks with rusty markings on them. We’ve never asked anyone if we could collect them and add them to our garden but we’ve never been told we couldn’t take them either. The local rock-expert-dude who sells necklaces and healing crystals in the mall is unimpressed with them — says the marks are scraped onto the stones by the heavy-duty, dirty-metal equipment used to quarry and carry them. They’re machine-made which means they’re human-made — and that makes them art. One of them is nice but it’s just an eagle, or whatever — something anyone could see in any skid-mark. The other is some kind of winged, jaunty, sub-terranean devil-man on his way to work at some hellish mine. Look, he’s got a pick-axe slung over his shoulder. We used to have a rock that looked like a picture of Don Quixote on horseback. But over the last winter his rust-smudged head wore away, or the stone healed itself, or I lost the power to see the image properly, or something. If I was someone else, maybe I might prefer the new headless horseman to the old non-knight. If I hadn’t gone looking for the rock so close to Fathers Day after spending years telling everyone Don Quixote was my father-in-law, maybe I would be glad. But I miss them — the stain on a rock and my not-quite second dad — I miss them both. This entry was posted in Books and Writing, Canlit, confessional, Family and tagged Don Quixote, father-in-law, Fathers Day, found art, gardening, in memory, jennifer quist, muses, outdoors, rock hunting. Bookmark the permalink.